In the next 18 centuries, due to geographical proximity with China the two countries shared many common cultural, philosophical and religious features. Vietnamese Buddhism has been greatly influenced by development of Mahayana Buddhism in China, with the dominant traditions of Ch’an/Zen, Pure Land, and the Diamond Vehicle. The southern part of the present Vietnam was originally occupied by the Cham (Champa)and the Cambodian (Khmer) people who followed both a syncretic Saiva-Mahayana Buddhism and Theravada Buddhism, although Champa probably had a Theravada presence from as early as the 3rd century CE, whilst Cambodia received the Theravada as late as the 12th century. The Vietnamese started to conquer and absorbed the land in the 15th century, and the current shape of the country was finalized in the 18th century. From that time onward, the dominant Viet followed the Mahayana tradition whilst the ethnic Cambodian practiced the Theravada tradition, and both traditions co-existed peacefully. In the 1930s, there were a number of movements in Vietnam for the revival and modernization of Buddhist activities. Together with the re-organization of Mahayana establishments, there developed a growing interest in the Theravadin meditation methods and also in Buddhist materials based on the Pali Canon. These were then available in French. Among the pioneers who brought Theravada Buddhism to the ethnic Viet was a young veterinary doctor named Le Van Giang. He was born in the South, received higher education in Hanoi, and after graduation, was sent to Phnom Penh, Cambodia, to work for the French government. During that time, he developed a growing interest in Buddhism. He started to study and practice the Pure Land and Vajrayana ways but was not satisfied. By chance, he met the Vice Sangharaja of the Cambodian Sangha and was recommended a book on the Noble Eightfold Path written in French. He was struck by the clear message in the book, and decided to try out the Theravada way. He learnt meditation on the breath (anapanasati) from a Cambodian monk at the Unalom Temple and achieved deep samadhi states. He continued the practice and after a few years, he decided to ordain and took the name of Ho-Tong or Vansarakkhita. In 1940, upon an invitation by a group of lay Buddhists led by Mr Nguyen Van Hieu, a close friend, he went back to Vietnam and helped to establish the first Theravada temple for Vietnamese Buddhists. The temple was named Buu-Quang (Ratana Ramsyarama). Later, the Cambodian Sangharaja, Venerable Chuon Nath, together with 30 Cambodian bhikkhus established the Sima boundary at this temple. The temple was destroyed by French troops in 1947, but was rebuilt in 1951. Here at Buu-Quang temple Venerable Ho-Tong, together with a several other Vietnamese bhikkhus who had received training in Cambodia, such as Venerables Thien-Luat, Buu-Chon, Kim-Quang, Gioi-Nghiem,Tinh-Su, Toi-Thang, and Giac-Quang, started teaching the Buddha Dhamma in the local Vietnamese language. He also translated many Buddhist materials from the Pali Canon, and Theravada became part of Vietnamese Buddhist activity in the country. 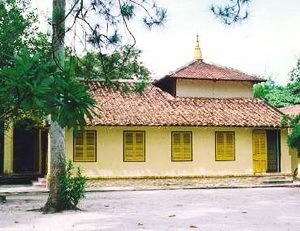 In 1949-1950, Venerable Ho-Tong together with Mr Nguyen Van Hieu established a new temple in Saigon, named Ky-Vien Tu (Jetavana Vihara). This new temple became the center of Theravada activities in Vietnam which continued to attract increasing interest among Vietnamese Buddhists. 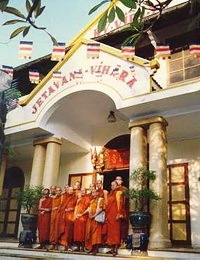 In 1957, the Vietnamese Theravada Association was formally established and recognized by the government, and the Theravada Sangha elected Venerable Ho-Tong as its first President, or Sangharaja. During that time, Dhamma activity was further strengthened by the presence ofVen. Narada from Sri Lanka. Ven. Narada had first come to Vietnam in the 1930s and brought with him many Bodhi tree saplings which he planted in many places throughout the country. During his subsequent visits in the 1950s and 1960s, he attracted many Buddhists to theTheravada tradition, one of whom was the popular translator, Mr Pham Kim Khanh who took the name of Sunanda. Mr Khanh has translated many books of Venerable Narada, including The Buddha and His Teachings, Buddhism in a Nutshell, Satipatthana Sutta, The Dhammapada, A Manual of Abhidhamma, etc. Mr Khanh, now in his 80s, lives in the USA and is still active in translating many Dhamma books by well-known meditation teachers from Thailand, Burma and Sri Lanka. From Saigon, the Theravada movement spread to other provinces, and soon, a number of Theravada temples for ethnic Viet Buddhists were established in many areas in the South and Central parts of Vietnam. In the 1960s and 1970s, a number of Vietnamese bhikkhus were sent overseas for further training, mostly in Thailand and some in Sri Lanka. Recently, this programme has been resumed and about 20 bhikkhus and nuns are receiving training in Burma. 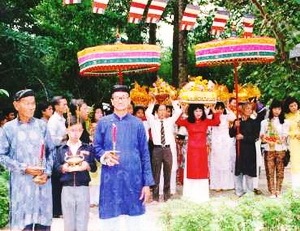 As at 1997, there were 64 Theravada temples throughout the country, of which 19 are located in Saigon and its vicinity. Beside Buu-Quang and Ky-Vien temples, other well known temples are Buu-Long, Giac-Quang, Tam-Bao(Da-Nang), Thien-Lam and Huyen-Khong (Hue), and the large Sakyamuni Buddha Monument (Thich-Ca Phat Dai) in Vung Tau. Historically, there has been a close relationship between the Cambodian and the Vietnamese bhikkhus. It is interesting to note that in 1979, a group of Vietnamese bhikkhus led by Venerables Buu-Chon and Gioi-Nghiem came to Phnom Penh tore-ordain 7 Cambodian monks, and thus re-established the Cambodian Sangha which had been destroyed by the Khmer Rouge when they were in control. Dhamma literature in the Vietnamese language come from two main sources: the Pali Canon and the Chinese Agamas, together with a large collection of Mahayana literature. Since 1980s, there has been an ongoing programme to publish these material. So far, 27 volumes of the first 4 Nikayas and the 4 Agamas have been produced. Work is under way to translate and publish the 5th Nikaya. In addition, a complete set of the Abhidhamma, translated by Venerable Tinh-Su, has been printed, together with the Milinda-Panha, the Visudhi-Magga, and many other works. In summary, although Buddhism in Vietnam is predominantly of the Mahayana form, the Theravada tradition is well recognized and is experiencing growing interest especially in the practice of meditation, in Nikaya-Agama literature and in Abhidhamma studies.